Use the attached Industry Item Templates to easily import items for this industry. Each template has industry specific features already defined. You just need to update it with your own data and then upload it. If you already have items in the system, you will be brought directly to the advanced mapping screen in our Wizard. If you need help selecting the correct field from to map to refer to the meanings of the fields here: Explanation of Item Fields in Pepperi. Click Finish and after a few minutes your items will be uploaded and you'll be directed to the listing of items in the import/export tab. If you have no items in the system at all you will be directed to the initial screens of our Wizard. Do you require a matrix Yes or No? Yes means you're uploading styles with color/size or other variants. 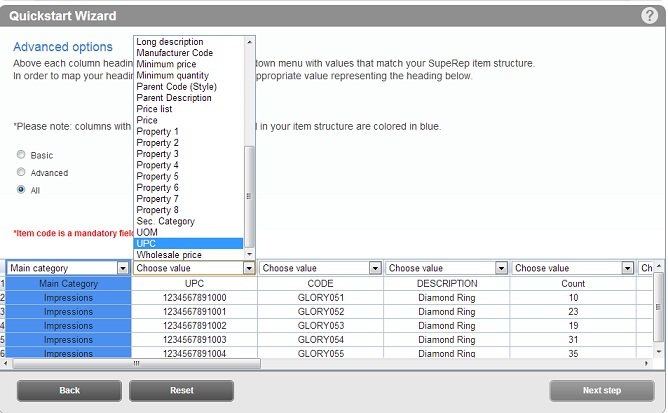 The items will be displayed in a matrix view in the catalog. Matrix items exist for the Fashion industry template only. No means you're uploading items with no variants (all other industries except Fashion). Select your default currency (you'll be able to change it later). Follow the steps in the wizard tabs. In each step you'll be prompted to select a column from your file that maps to the respective Pepperi field. For example: the first step selects the Main Category, and so forth. .
Once you reach the last tab you can click next and you'll be presented with a sample preview of what an item might look like in the catalog with some of your fields populated. If you wish to map additional fields click on Advanced and you'll be brought to the advanced mapping screen where you can map the additional fields from the pull down menu. If you need help selecting the correct field from the pull down menu refer to the meanings of the fields here: Explanation of Item Fields.